Interest rates are the raw material used in manufacturing annuities. Rates are currently very low--the 10 year treasury note is hovering around 3.4 percent and 30 year mortgage rates are now less than 5 percent. The financial crisis has led to an upsurge in the sale of fixed annuities. Fed-up with volatility in the capital markets, many people have sought the apparent safety and stability of fixed payments that are guaranteed. There are clear dangers, however, to locking-in fixed annuity payments when interest rates are so low. First, fixed annuity payments are based on prevailing interest rates. As a result, today’s fixed annuity purchasers may be buying very expensive annuities unless interest rates remain stable or decrease during the term of the annuity payments. Second, any future increase in inflation will erode the purchasing power of an annuity purchased today unless that annuity adjusts for inflation. As an example, let’s take a look at a hypothetical person named Robert. Robert is 65 years old and is in relatively good health. Robert has $100,000 to invest and he wants to buy a single premium immediate annuity (SPIA) that will immediately start providing monthly annuity payments for the remainder of his life in exchange for his $100,000. To make matters worse, let’s assume that Robert does purchase the SPIA at today’s 3.4 percent interest rate. Let’s assume that inflation averages 4 percent over the next 10 years. Robert’s $708 monthly payment will be worth 67.5 percent of what it is today. 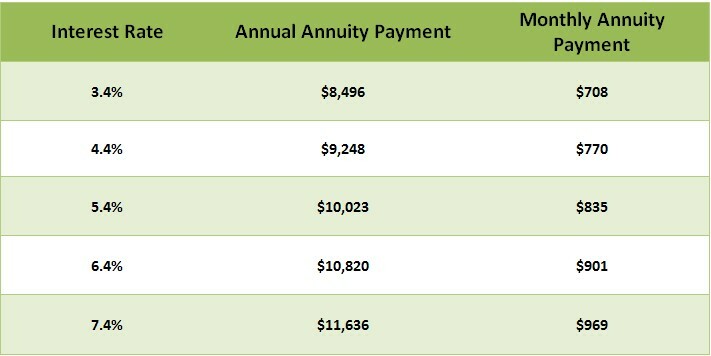 In other words, the purchasing power of Robert’s $708 monthly annuity payment will have eroded by 32.5 percent in just 10 years. Robert is young and healthy and the SPIA provides payments for the remainder of his lifetime. As a result, the damaging effects of inflation will would likely persist for much longer than 10 years unless, similar to Japan over the past 20 years, the United States experiences a long and persistent deflation. So what to do in a low interest rate environment? Do nothing and completely hold off on any type of annuity purchase? That could be tough depending on your situation? The article is intended to help people understand the relationship between annuities and interest rates. Interest rates are the primary ingredients in all annuities. Purchasers and would be purchasers of fixed annuities need to be especially aware of how interest rates affect their annuity payments. While waiting it out for an interest increase is understandably not an option for many people, there are other types of annuities (variable, fixed indexed) that have payments that are not locked-in in this very low interest rate environment. Tax Deferral and Safety of Principal are also important! Tom's right on the mark - interest rates are always a driver that creates rate of return on annuities. Also purchasing an annuity must be suitable for the specific client. For example, if Robert had 90% of his assets which were anywhere from $300 K to say upwards of $10 million in a managed account, an annuity might not be the best option for all of his money. Based on my experience, Tax Deferral is also an important component of an annuity for clients who don't want to pay income tax on interest earnings which are not going to be spent now. It's to their financial advantage to defer taxation if they are at all able to. Another essential component of an annuity based on recent stock market volatility is Safety of Principal. Safety of Principal protects the client from loss of capital. Interest earnings also don't effect Social Security taxation until they're are withdrawn depending on income level. This makes Fixed Annuities suitable investments for individuals 40 years and beyond. Can you elaborate on the interest earnings/Social Security taxation point? I am interested in hearing more on that. Up to 85% of Social Security Income is taxable for a single person whose AGI exceeds 34,000 and the same applies for a married couple whose AGI exceeds 44,000. Unlike RMDs which are associated wth Qualified Plans, a Non-Qualified Annuity owner can decide whether or not to make a withdrawal each year. The annuity owner, in many cases, is able to keep the income under the aforementiond levels. This area of investing is new to me and I don't know what all the acronyms are and don't completely understand the financial concepts. Can you share a bit more about what you mean by Qualified Plans are and specifically what RMD stands for? A Qualified Plan is a 401-K, IRA or SEP (Simplified Employee Pension). RMD stands for Required Minimum Distribution (required by the IRS) which is a mandatory withdrawal from a Qualified Plan at age 70.5. I appreciate your question. Your question reminds tnat I need to avoid using acronyms so much. I need to explain things in a litle more detail.